The Autotrader Must Test Drive Awards is intended to benefit a broad set of shoppers by highlighting a diverse group of 12 vehicles that simply must be seen and experienced to believe. Logging thousands of miles, the Autotrader editorial experts chose the winners of the annual Must Test Drive Awards based on a wide-ranging set of criteria, including interior comfort and materials, available technology features and ride quality, and each vehicle was agreed upon unanimously by the entire editorial team. To be considered for a Must Test Drive Award, a vehicle must be of the current or next model-year and be available to purchase at the time of the awards announcement. It must have a base price under $75,000, offering a significant value for the asking price, and must score a 3.5 or higher on Autotrader’s five-point scale. With these factors in mind, the 2018 winners all have something special that separates them from the competition. The variety of award-winning models below are weighted equally and are unranked, as Autotrader’s experts understand the needs of each shopper are unique. The Buick Regal TourX is a mid-size station wagon with all-wheel drive. That may not sound so enticing, but the TourX is one of the first real competitors to the Subaru Outback, and we were impressed with virtually every aspect of it. Not only does it combine crossover or SUV cargo capacity with a car-like driving experience, the TourX boasts excellent fuel economy (21 miles per gallon city and 29 mpg highway) despite a potent 250-horsepower 2.0-liter turbocharged engine. The latest Honda Accord is simply the best-ever version of the popular mid-size sedan. While you might be tricked into thinking it’s just a refreshed Accord with some more features, you’d be wrong. The styling is different, and there’s more available equipment, but the big news is the fuel economy. The 2018 Accord now reaches as high as 30 miles per gallon in the city and 38 mpg on the highway, which is a level previously thought to only be achievable if you bought a compact or subcompact car. The latest Jeep Wrangler is an excellent SUV, and while it looks fairly similar to the outgoing model, serious shoppers will notice the major differences. There is, for instance, a new turbocharged 4-cylinder powertrain which will improve fuel economy, along with a revised interior that’s dramatically more comfortable than the outgoing model’s cabin. The Range Rover Velar is absolutely gorgeous, whether you’re looking at it from the inside or from the outside. The exterior styling is handsome and sleek, and the interior is modern and top-quality. This is one of the few luxury vehicles where I can actually see and feel exactly where the money was spent. The Velar’s daring exterior styling and an elegant interior make it a standout in Land Rover’s lineup. The latest Lincoln Navigator is the best version yet of the full-size luxury SUV, and it may just be the best full-size luxury SUV available today. The 2018 Navigator is more expensive than the outgoing model, with a starting price of around $73,000 with shipping, but it’s also gorgeous and reminds everyone that there is still room for large SUVs on the market. The Mercedes-Benz E-Class Coupe is one of the most elegant and graceful two-door models in the Mercedes-Benz range. It’s an excellent car with outstanding performance, touting a 329-horsepower turbocharged V6 that pushes it from 0 to 60 in 5.5 seconds. The latest Nissan Leaf is a big leap forward over the old model, and it now provides a smart value in its segment. The Leaf eliminates range anxiety while complimenting the car’s highly improved interior and loads of awesome tech and safety features. Perfectly balancing range and price, the 2018 Leaf boasts an impressive range of 151 miles and a reasonable starting price of around $31,000 with shipping (before incentives, which can be substantial). The latest Toyota Camry offers major changes from prior models, which is a difficult feat, considering prior models were pretty impressive. This Camry has attitude and shows Toyota is taking risks. Admittedly, the new Camry isn’t just sporty and bold, it’s also still the same reliable, roomy sedan that’s always been highly popular in the United States, and it’s priced reasonably to compete with rivals, with a starting price of around $24,500. The new Volvo XC60 delivers Volvo’s impressive interior and technology to a completely new segment, scaling down the same stunning cabin from the popular XC90 into a more affordable package. Indeed, the XC60 is a huge upgrade from the outgoing model without a significant price jump, as it starts from around $42,000 with shipping. Find the Must Test Drive Award winning vehicles at Autotrader.com and request a test drive from your local dealer. You also can save the cars you like on Autotrader and get alerts on price drops, available incentives and more. 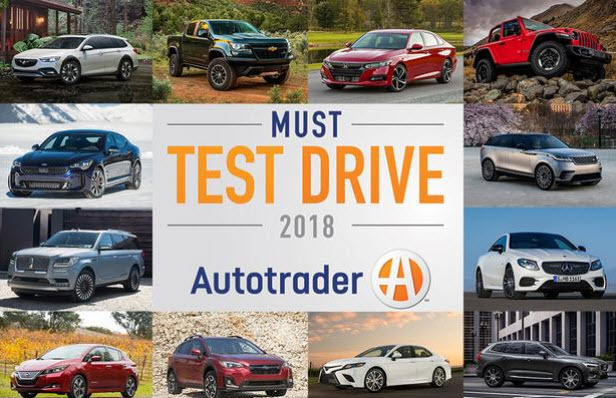 To learn more about the 2018 Autotrader Must Test Drive Awards, including photos, detailed vehicle information and available inventory, visit https://www.autotrader.com/musttestdrive.